Make sure your guests have easy access to napkins when things get messy with this San Jamar H5000STBK minifold Venue™ stand mount napkin dispenser. It's a sleek and efficient addition to any snackbar, pizzeria, or concession stand and is made of impact-resistant plastic for extra durability. 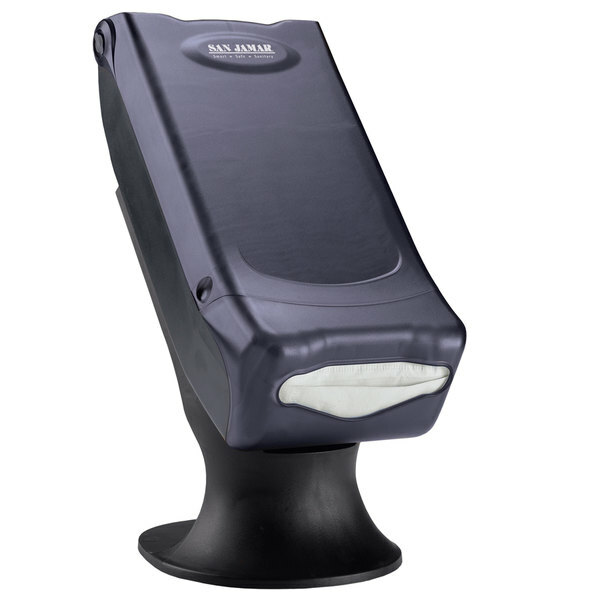 The stand mount helps to enhance the image of your establishment while creating a more user-friendly dispensing angle. It features a translucent black pearl cover which makes it easy to see when your napkin supply is running low and it is time to refill. The unique monorail design allows for gravity-fed dispensing, and a built-in overload protection system keeps the dispenser operating smoothly even when overfilled. For added convenience, it holds up to 33% more napkins than similar models, cutting down on the number of times it needs to be refilled. 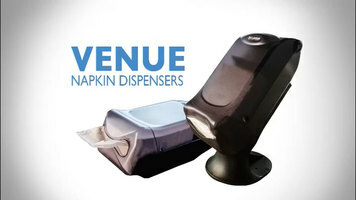 Keep napkins ready and available with this functional and affordable napkin dispenser! This napkin dispenser is great for festivals or events. It is very easy to load and is lightweight and durable. it can also be mounted. This is a great little napkin dispenser it takes up very little space and it holds a good size portion of napkins I would recommend these for all kinds of businesses . No need to refills too often. If you are way to busy this stand mount napkin dispenser gives you freedom to do your job and not to worry about refilling the napkins. Great napkin dispenser. Easy to use, stores a decent amount of napkins in it. Usually only have to refill it every couple of days. Decently priced. If you have a self service area in your restaurant where guests grab condiments and napkins, the San Jamar Stand Dispenser is a must have. Bought this last year from Webstaurant. Came will a slight bent to the right but I was able to assemble it. It worked so I never thought about it. Sadly, last week, the bottom part snapped out of the bent side so now we have to get another one. Very nice dispenser and easy to maintain. Beware of different model and matching stands. The face cover models are also very confusing. Be sure to check with the supplier. I had to return mine since the stand, and holder did not match. i highly recommend this dispenser. great size and easily placed anywhere. i was having problems with customers taking to mamy napkins and with this dispenser this has cut down this problem alot. it also looks great. We purchased these to mount on our hot dog carts. They are professional, clean and made our vending carts look that much more professional. I really liked how easy they are to load and how large their capacity was. We will be uising these on all of our new carts.